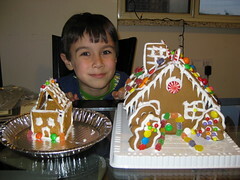 The graham cracker house to the left was mine. It had some stability issues. The roof kept pushing the left-wall over. By the time it completely dried, it looked a little "off." I must give kudos to this house in a box. 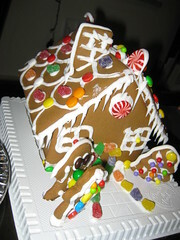 We had a blast building and decorating it. Making these from scratch isn't for the faint of heart.